This “plank piece” explored the filleting in three dimensions of an oak plank, which allowed for the telescoping of both ends. 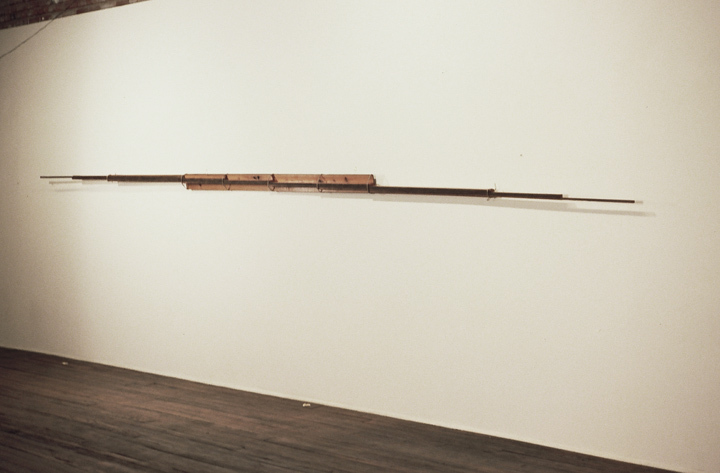 The ends would be tied at pre-determined intervals at the discretion of the owner/viewer of the piece depending on the length of the mounting wall. The horizontal center of the piece remains part of the original plank forming a “T” in profile. The upper and lower telescoping sections were cut as “L” forms in profile with the smallest end pieces in “square” profile. The piece could be collapsed into its original 90-inch plank for storage or transport. H: 5 in. x W: 22 ft. 3 in. x D: 3 in.